Childhood hunger is a real thing. Even in the U.S. Even in Georgia. Even in the city in which I live. In fact, it even impacts the students at my children’s school. Sometimes, the only meals a child will get during the week are the ones provided at school. So last week when we had three snow days, there were many kids that went without food. During the school day, there is also a snack time. Many children don’t have a snack because they have to bring them from home. Some teachers reach into their pockets and bring in snacks for the children that aren’t able to. We send in snack for the class as well to help those less fortunate students and also to help the teachers. I was asked to team up with a local accredited K-12 educational institution (public or private), or registered 501(c)(3) non-profit organization that focuses on serving children and youth, to get them set up with the Champions for Kids program and get them started with Snacks for Students which is a part of the SIMPLE Giving campaign. Knowing that our local elementary could use some help, I reached out to them and helped to get them signed up as a beneficiary of the program. Now through March 4th (and again hopefully soon), U.S. customers at more than 3,600 participating Walmart stores can purchase snacks and breakfast items for children and place them inside designated donation bins. All of the donations donations made in-store will stay in the local community and be distributed through school districts or youth-based organizations. Once the school was signed up, I went to the Walmart store that is set up with the elementary school to pick up some items to go in the donation bins. Unfortunately, due to all of the bad weather, the bins haven’t yet made it to the store, but there will be other collections throughout the year. In the mean time, I picked up a bunch of snacks that would work for snack time or breakfast time. Since the bins aren’t there yet, I will be dropping them off with the principal to distribute to the classes. In addition to the donations made by the community, Champions for Kids, General Mills, Kellogg’s, Emerald and Kettle Chips will provide 13 awards, totaling $45,000, to school districts and participating youth-based organizations based on the total number of donated items collected in each store. In 2013, SIMPLE Giving began in 24 central Arkansas Walmart stores and was extended to Walmart stores across 11 states in 2014. The Snacks for Students program is the first of several campaigns to launch nationally, with the goal to provide resources for more than 10 million children in 2015. Champions for Kids makes it simple to give kids in your community the resources they need to thrive. Since 2004, Champions for Kids has served more than 5.4 million children across all 50 states through in-store donation campaigns, service projects and community events. Follow Champions for Kids on Twitter and Facebook and check out #SnacksForStudents. 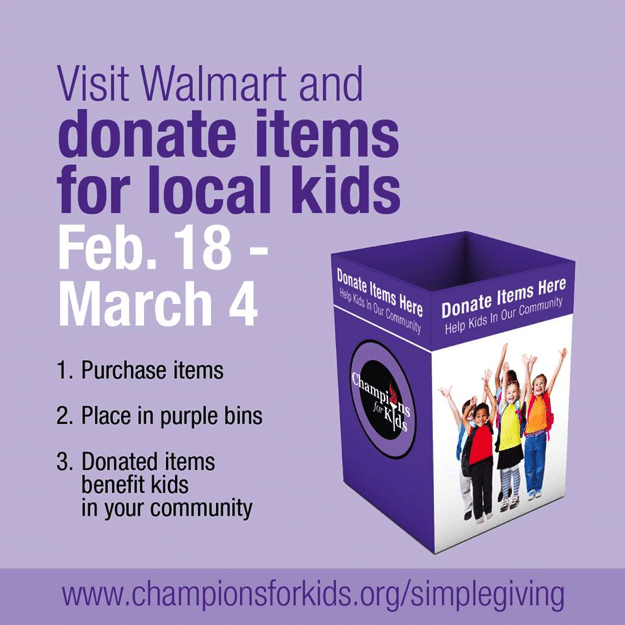 Have you seen a purple Champions for Kids collection bin at your neighborhood Walmart? Have you made a donation? what a great idea and organization. Knowing that this will benefit kids in your immediate area is a definite plus. Yes, I really like that it stays in the community. I dropped off a ton of fruit and applesauce pouches today to the elementary school! 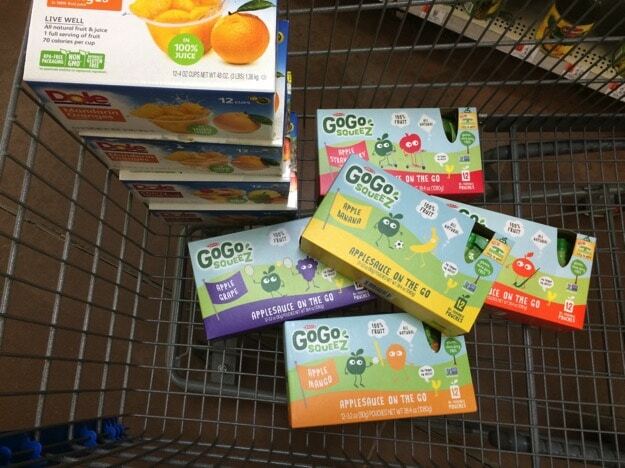 My kids love those GoGo Squeezes. Thanks for letting me know about this community initiative. I think it is a great idea. It’s nice to know that Walmart is doing something so wonderful for the local community. Thanks for sharing. I hope they place the bins right by the checkout stations – then people will have it so easy to participate – a great idea to help your community! What a great program! I wish I saw this sooner but hopefully there will be more opportunities to donate throughout the year. There are several more slated throughout the year. And, because of the bad weather, I’ve heard many stores are extending them! Check yours the next time you are there! What a fantastic program! 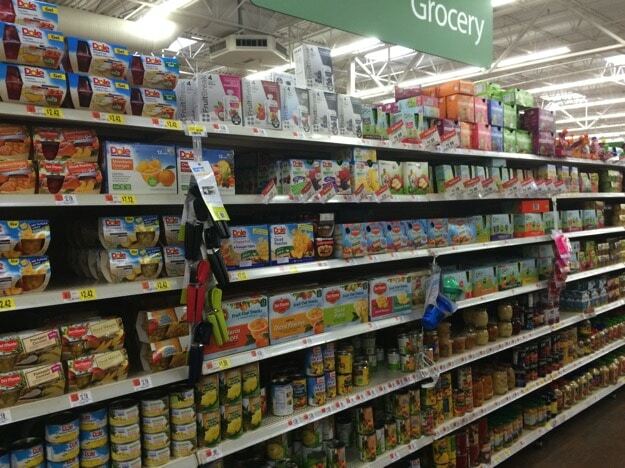 I haven’t seen the bins at Walmart, but I’m not sure I would have known to look for them either. Will be on alert next time I’m in the store. Thanks for sharing this. They are supposed to be by the entrances of the stores….but it seems a lot of stores didn’t get them. And, some stores might not have a group working with them. Hopefully, your local store will have them soon! Such a neat program. I like that you donated fruit…when I was teaching all students were provided free breakfast. Unfortunately, breakfast was often funnel cakes and icing covered danishes. I am also impressed Wal-Mart stocks packages with larger quantities inside! Yes, it’s the same here. A PopTart or something totally non nutritious. And I was glad to see the containers held more than 4 pouches, too. I was happy to give a big donation to the elementary school. Our bins should be up today – and I’ll definitely be donating. Fruit cups are a great idea! Had no idea! This is great. Would love to donate anytime.